Round 2 of the 2010 Australia Superbike series saw Team Suzuki's defending champion Josh Waters once again dominate the field on his GSXR 1000 after confidently recording the quickest practice laps on Friday to pull pole position for the Saturday session he stormed to a convincing win on the wet track. Darwin's unseasonal lingering wet weather poured down just prior to the start of race 1 and made conditions difficult with many riders crashing during the course of the race, but the weather cleared in time for race 2 which ended with Waters crossing the line three seconds ahead Bryan Staring. Waters has had nothing less than praise for Team Suzuki and has been enthusiastic about the performance and handling of the bike. Some of the HighRPM crew joined the crowd of almost 5000 others at the Hidden Valley venue on both Saturday and Sunday sessions to take in the event atmosphere. Our own presenter Christine Watts was also on hand promoting Team KTM on both days as well as providing other teams with local promoters. 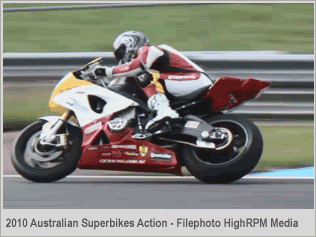 2010 Australian Superbikes | HighRPM Highlights from High RPM on Vimeo.